The StumbleUpon Web discovery service has carved out a big presence for itself on the Web, with a reported 15 million users and 1 billion personalized recommendations each month. Last month, in fact, StumbleUpon drove more traffic to U.S. websites than even Facebook, according to figures compiled by Web analytics firm StatCounter. StumbleUpon wants to broaden its reach into the mobile world, and to that end, it rolled out a revamped version of its iOS app on Tuesday. The free StumbleUpon app looks to recreate the service’s Web discovery experience on Apple’s iOS devices. Sign up for the service—you can do so directly from the app or on the website—select some interests, and tap a button: The StumbleUpon app will find articles, videos, photos, and websites based on those interests and what other StumbleUpon users are recommending. You’re able to share any content you come across with your StumbleUpon friends as well as via Twitter and Facebook. A gray social bar at the top of StumbleUpon pages lets you see who likes the content you’re looking at and gives you access to user comments. Tuesday’s 1.4 update to StumbleUpon ramps up the social features of the mobile app. Pages now feature a social bar across the top of each page, showing you a StumbleUpon user that “liked” that particular piece of content, giving you a way to find similar likes from that user if the content also tickled your fancy. The app also underwent an interface makeover, with more-prominent photo thumbnails to show off your interests and the people you follow. The app’s homepage also features links to photos, videos, news, and friends for faster stumbling. In addition to the omnipresent Stumble button, you can also swipe from page to page to discover new content. Some of the interface elements are still a little tough to manage. There’s a Thumb’s Down icon that lets you notify StumbleUpon you’re not particularly impressed with the content it’s provided you. A triangle next to the icon allows you to provide further instructions (such as reporting spam or duplicate content or blocking a user), but the triangle is so tiny, it’s awfully hard to access. StumbleUpon may be a major player on the Web, but it faces some stiff competition on the iOS platform, where Flipboard sets the standard for delivering personalized news to your iPad. Other apps, including Zite and Taptu, put a similar emphasis on tailoring the Web to your specific interests. Still, StumbleUpon puts more of an emphasis on finding parts of the Web you might not otherwise discover, which may help the app stand apart from the ever-growing field of apps focusing on personalizing your browsing. 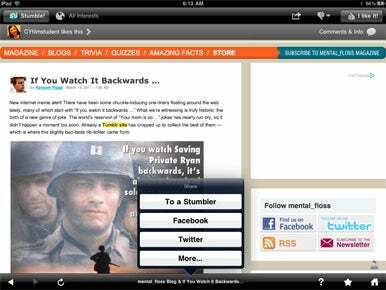 StumbleUpon is a universal app that runs on the iPhone and iPod touch as well as the iPad. The 1.4 update brings more modest changes to the version built for Apple’s smaller iOS devices—the iPhone app sports the social bar, and StumbleUpon promises faster browsing and bug fixes. The free StumbleUpon app runs on iOS 3.0 or later.